After talking to people at VegFest 2009 we decided to try out weekly delivery of fresh, mostly all seasonal, organic produce. 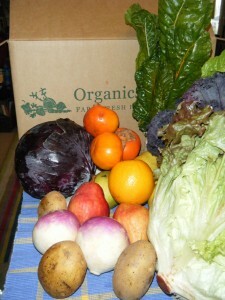 Unlike a CSA the deliveries would not stop during winter, some produce would come from California and Mexico. After a few weeks of delivery I decided to start blogging about, staring October 26, 2009. Most weeks since we began I have blogged about what arrived, what we still had in the house, and what we didn’t manage to get used up. This started out as an exercise to see if it was financially worth it to have our produce delivered this way, but it has become something more interesting. Quite early on it began to show us that we really didn’t eat much fruit and should include more in our diet. It has fostered a lot of creativity in trying to use up the amount of produce, sometimes new and unusual items, and cook mostly seasonally. It has certainly increase the amount of fresh fruits and veggies we eat! I have no ties to Organics to You, although they have at times linked to my recipes. This is purely an exercise in looking at the produce we eat, trying to eat mostly local and mostly seasonal. We at times buy additional produce because we want something special, have visited any number of u-pick places within easy reach of Portland, and we have a growing garden at our home.